This post is in partnership with The Reef 28, which I personally visited and adored! Whether you are planning your honeymoon or a getaway with your besties, heading to an all-inclusive resort can help enhance your experience. It’s relaxing to kick back and enjoy music, amazing food, and free-flowing cocktails in a gorgeous environment. The recently opened The Reef 28 offers all of those things in a location that is designed for adults. I loved my time there, and I can’t wait to share some of my favorite aspects of this beautiful destination. Normally the best should be saved for last, but this rooftop needs to take center stage. 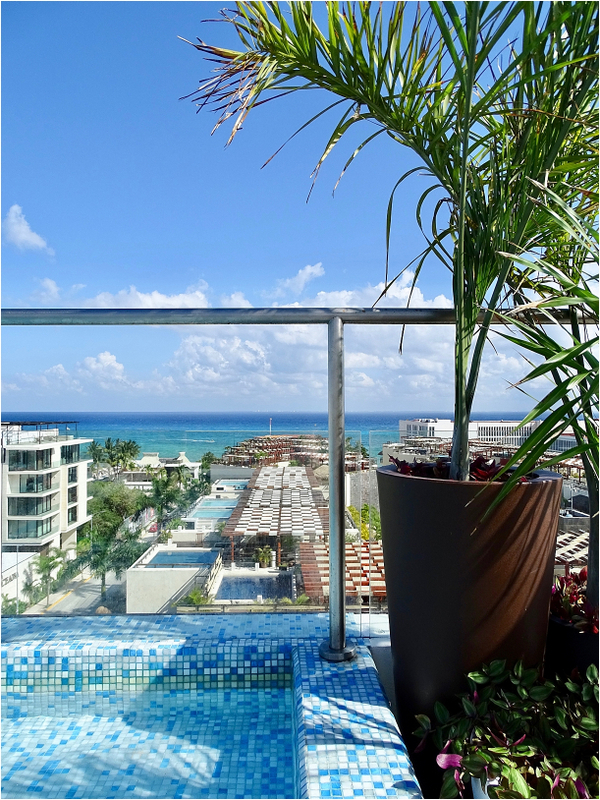 Lounge chairs and private cabanas focus on the beautifully tiled pool that overlooks the ocean and its surroundings. 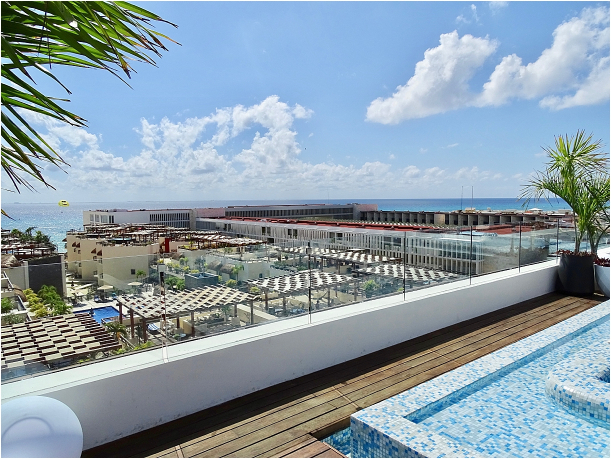 Hot tubs, seating areas, and a rooftop bar add to the ambiance of fun in the sun. If lounging isn’t quite your thing, you can swim in the pool, listen to the DJ spin tunes, or take part in an intense game of giant Jenga. No matter what, you are destined to have fun once you wake up and decide to head to the top level of The Reef 28. Take a peek at how gorgeous it is! Now that you have seen the highlight, we can start in the lobby with first impressions. Filled with fun pops of color, fragrant flowers, and a collection of swinging chairs (hello, photo op! ), the lobby is inviting and evokes a sense of excitement. This area also includes the front desk, the concierge, and a bar, so waiting for friends or just hanging out for a bit is perfectly feasible. So lovely! Of course, once you arrive at an all-inclusive resort, heading to the room is a must to freshen up and unpack. A spacious suite may be just the ticket if you are hosting a bachelorette weekend as the suites can sleep several, and there is plenty of room for everyone to have their own space. There are even two full bathrooms – talk about a dream room! The natural, earthy color palette gives off a modern vibe while also being completely relaxing. Plus, there are two balconies for enjoying drinks at night or coffee in the morning. What a great home base to have while you are staying at The Reef 28! Dining at The Reef 28 is something even a true foodie can enjoy! The fact that it is an all-inclusive resort doesn’t mean that they are shy about offering amazing selections. Various restaurants focus on different cuisines. Enjoy Thai food at Asitico, Mexican at Cachito, or a buffet at Venti8cho, which also offers an a la carte menu. Each space has its own decorative flair, which adds to the ambiance. From breakfast to after dinner drinks, the food is delicious and the service impeccable. Don’t want to dine out? Service in your room is also a good choice! Of course, whether you are at The Reef 28 with your sweetie or your bridesmaids, a trip to Okom Spa is both relaxing and rejuvenating. A massage – either individually or as a couple – can realign your entire body, and experiencing the hydrospa does wonders for tired muscles. Curious about the surrounding area? Well, just a block away from the all-inclusive resort is 5th Avenue, a walking street filled with beautiful boutiques, delectable restaurants, and a vibrant nightlife. Local artists also showcase their paintings and wares, which make ideal souvenirs for those who enjoy taking home something creative. There truly is so much for the casual tourist to enjoy while at The Reef 28! Want to get married in an intimate, beautiful setting? The Reef 28 also offers a chic and sophisticated space to hold your ceremony and reception. 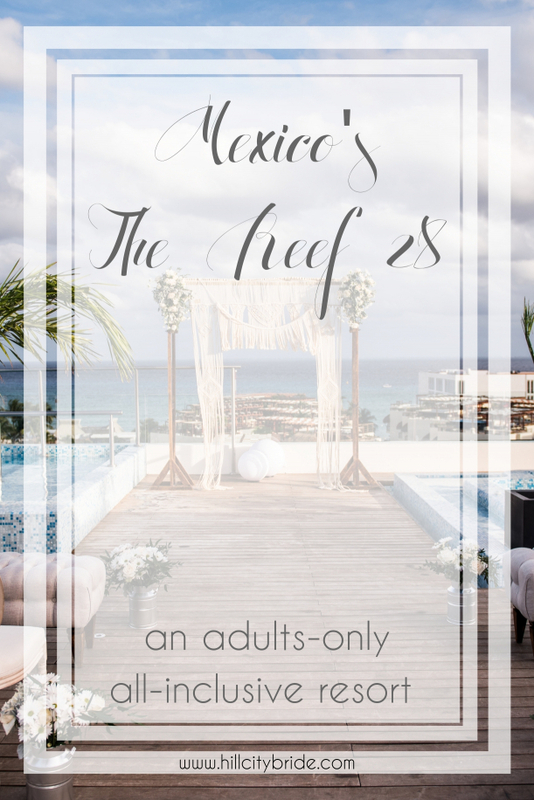 Say “I do” overlooking the ocean, have cocktails at Arriba, and mingle with your guests in the luxurious lounge area. The Reef 28 can craft a unique and memorable event for you and your guests as you spend a few days enjoying their property and the local area. Speaking of the local area, whether you are looking for experiences for your guests or yourself on a honeymoon, there are several things to do in Playa del Carmen. Explore Mayan ruins, snorkel, swim with dolphins, or just relax your time away! Check here to see what the local area has to offer. My husband and I had the opportunity to visit The Reef 28 (and one of their sister properties, which I will be writing about soon!) for a few days. To be completely transparent, the ideal vacation for me is heading to Europe with quaint towns, a ton of history, and adorable boutique shops and restaurants. So, the idea of heading to an all-inclusive resort was appealing mostly because I knew my audience would love it. But I did, too! BUT here are my own personal reasons why I fell in love with The Reef 28. It is a boutique chain. I love supporting local and small. I personally enjoy supporting boutique brands, and The Reef Resorts fits the bill nicely. They have 3 all-inclusive resorts, which have impeccable service, amazing food, and on-site activities to enjoy. The area is filled with arts and a local flair. 5th Avenue satiated my desire to browse boutique shops and discover local art. I’m not a huge nightlife person, so the ability to stroll a safe, well lit walking street late into the evening was fun. The food was fabulous! I enjoyed having several dining options, and every bite was delicious. Instead of feeling as though we were at an all-inclusive resort, it felt like we were dining at local restaurants due to the quality of food and the service of the staff, which I truly appreciated. Drinks. And more drinks. I am SUCH a lightweight, but it was fun to test out different drinks – the more frozen and fruitier, the better. It was nice to lounge on the rooftop with a drink in hand. Just don’t overdo it! Spa? Yes, please! It was wonderful to have an on-site spa. We had a couples massage and hydrotherapy session, which were both so relaxing. This is not part of the all-inclusive fee, but it was such a treat that soothed our souls. I loved the decor. Every space – restaurants, lobby, room, rooftop – was so well designed and unique that it created this vibe of being in an amazing place. Which we were! You can visit their other resorts. The Reef 28 isn’t beachfront, although it is one block off of the beach (which was a bit busy for my taste!). The Reef Resorts offers a shuttle service that goes between their resorts so that you can head to one of their more private beach areas. Such a plus! As final thoughts, I want to say that bigger isn’t always better. Some may fear that a smaller resort may not have the amenities, food options, or service that a chain resort may have, but I found just the opposite. The attention to detail in the food, decor, and hospitality was flawless. If you would like to find out more about The Reef 28, be sure to check them out HERE.